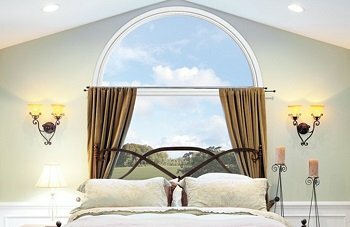 Round Top windows from Infinity® from Marvin are a very elegant way to bring light into your favorite room while adding a bit of breathtaking beauty at the same time. These amazing windows really open-up your home and allow you to view trees, clouds, skylines and more with ease, while classic Infinity® construction and materials like Ultrex® fiberglass help keep energy conservation to a maximum throughout the window’s lifetime. Our round top windows also come with customizable options such as shaped designs like Eyebrow, Half Round, and Half Round above Springline, which can be combined with other Infinity® windows for unique and innovative pairings. Featuring six exterior color choices, 2 interior color choices as well as our stainable wood grain interior – EverWood® – your home can be transformed with loft-like energy thanks to durable round top windows from Infinity® as sold by Bee. Would you like to add round top windows by Marvin to your home? We would love to assist you – Contact Bee Window today!